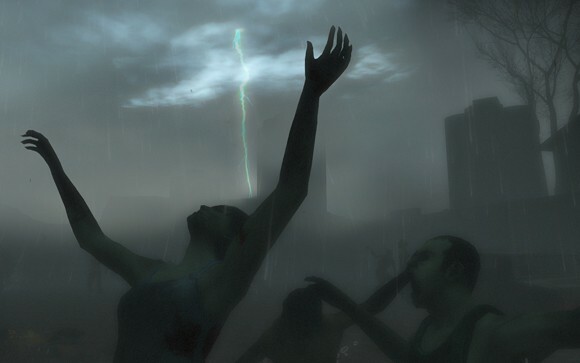 GameSpy has a hands on preview with two of Left 4 Dead 2's campaigns. While you've heard quite a bit already about the Swamp Fever campaign, thanks to it's public playability at the San Diego Comic-Con, you haven't heard much about Parish. Swamp Fever is apparently the only campaign in the game that takes place at night, while the other four will be on display during the day. And while Swamp Fever has a traditional finale mission where you must hole up and wait for rescue, Parish has a different kind of climax. The final part of the Parish campaign had our team being forced across a heavily damaged bridge, with the promise of rescue waiting on the other side. I know what you're thinking: It sounds like you and your team can conveniently set your own pace. The reality is that this is only partially true. Sure, you and your team coordinate and pick when to move forward, but since the infected just keep coming every second it forces your team to fight tooth and nail for every inch, and sets you up for a quick death if you panic. I've played a lot of the original L4D, but never did I feel this tension of having to coordinate what was essentially a psychotic rush through a hoard of zombies. The climaxes aren't the only big difference in Left 4 Dead 2. Levels have been mixed up to add moments of tension. One such example has a the team of four in a parking lot filled with cars and alarms and a few dozen zombies. You'll need to carefully navigate and pick of zombies without a stray shot hitting an alarm. Melee weapons also had a big change to the game, and while their use is somewhat limited, using a new powerup called adrenaline makes you run fast and attack more when you need to catch up to the rest of your co-op partners. All in all it sounds like Left 4 Dead 2 is shaping up to be a solid sequel, perhaps it's not the quick money grab a lot of folks thought it was going to be. With only a few months till release we'll all know soon enough. Page created in 0.4253 seconds.